The adaptation of Shakespeare to film is often a solemn affair, the original text handled with careful kid gloves, with the end result that most cinematic versions of the plays, even the comedies, end up tame and overly reverent of their source material. Whether this grows from the fact that Shakespeare has become immediately identified with a tone of strained seriousness and aspirations toward prestige, or the mere fear that fussing with the text will elicit accusations of ignorant Hollywood simpletons tarnishing the Bard’s perfect verse, the act of fussing around with the plays has traditionally been considered tantamount to sacrilege. Yet despite his status as the English language’s Ur-Auteur, a writer with an unmatched level of cultural influence and an instantly identifiable style, the author’s work, like anyone else’s, still benefits from a little creative reimagining. 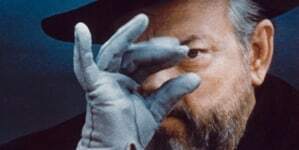 No one was better at this than Orson Welles, who across three unorthodox films promoted a playful use of Shakespeare which interpreted rather than recreated the texts, continuing a tradition of daring revision that had started with his unorthodox stage revivals. The first of these was the modestly tweaked Macbeth, filmed on old Western sets on the Republic Studios lot, followed by the bolder Othello, which jettisoned a healthy chunk of the play and shrunk its epic story down into a gloomy castle-set noir, playing out in cramped, damp hallways and dominated by looming shadows. 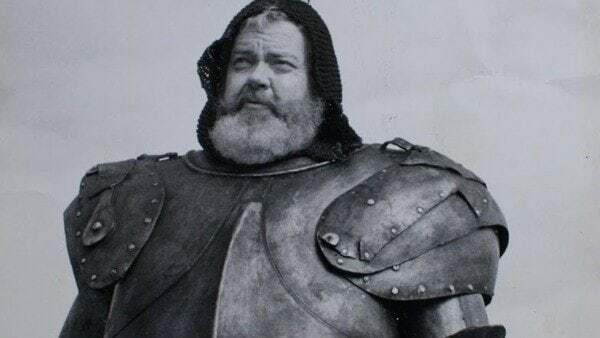 The last, and perhaps most audacious of his adaptations is Chimes at Midnight (alternatively known as Falstaff) which slaps together material from five different plays (and throws in some external words) to tell the life of the stout, uncouth knight, one of Shakespeare’s most robust and enduring characters. The interesting thing here is that Falstaff is not a heroic character, belonging more to the low-comedy side of the Shakespeare canon, and the act of refocusing the story around him changes the entire tenor of the narrative, which draws most heavily from the events of Henry IV. Falstaff first appears as aide-de-camp and advisor to young Prince Hal, his overgrown childishness pairing naturally with the youth’s wild and reckless demeanor. 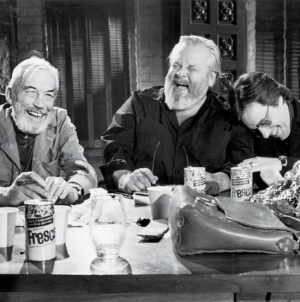 They spend most of their time drinking and carousing in a rustic brothel, and it’s clear from how much more time is spent here, in loose, playful scenes that vibrate with boozy energy, that Welles is less than interested in the arch chess games of court politics and battle strategies that draw many other adapters. 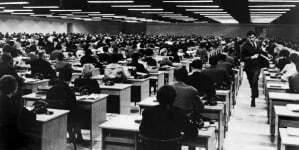 Telling the story of Henry’s slow passage from gallivanting bad boy to wise king, he offers both types of scenes, but the classical strategy-focused ones are purposefully dour, shot in drab grays and defined by stationary crowds and lockstep movement. 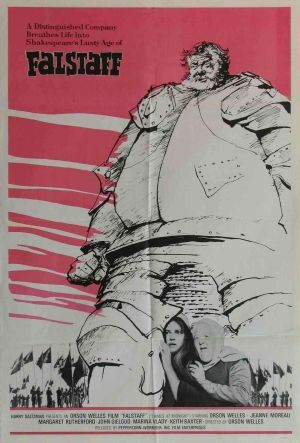 The scenes with Falstaff, played by Welles himself (exaggerating his already sizable bulk inside a hilariously rotund fat suit), are overflowing with vivacity, as the always outrageous, usually drunk knight gets further embroiled in the efforts to stop a burgeoning rebellion. 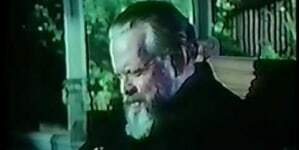 Welles enfolds this tale of political treachery – partially aided by Hal’s sidekick and eventual adversary Hotspur – within Falstaff’s matched betrayal by his young master, who steadily transforms into the ever-more serious Henry. What occurs here also functions as a symbolic representation of how Shakespeare too often gets presented onscreen, the initial joy and excitement of loose interpretation turning to mechanical adaptation as the film progresses. 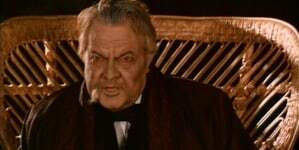 The turning point of this process is the climactic Battle of Shrewsbury, which is depicted via two simultaneous perspectives, the two sides of Welles’ approach clashing mightily together. At one end the focus is stately and serious, detailing the grand march of elaborately arrayed armies converging upon each other. In the second the clumsy, elephantine Falstaff, stuffed into a suit of armor like a ridiculous armadillo, scuttles around the battlefield, trying to avoid the action, ducking from one hiding place to another. The two viewpoints collide as the fighting accelerates, whipped into a frenzied approximation of Eisensteinian montage, chaos taking over as the ordered battle lines crumble in the mud. The merging of these two perspectives communicates an implicit rejection of war and the petty power struggles which necessitate it, the pairing of hilarity and horror side by side, as brutal violence and the scampering movements of a devoted coward are intercut into a single absurd ballet. This collision makes for one of the finest set pieces in Welles’ oeuvre, with the director offering a veritable master class in how to captivatingly convey action, toying with film speeds, hopping from one vantage point to another, presaging the modern practice of cut-to-ribbons battle confrontations by decades, without losing any of the scene’s focus. How Welles managed to express such a sense of magnitude on the minuscule budgets he was getting at this point is amazing. It’s the high point of the movie, and the last appearance of a truly enlivened Falstaff, with the remaining scenes tilting toward despair, looping back toward the sad opening image of the huge man huddled by a fire, remembering the glory days that will be shown early in the film. The victory at Shrewsbury cements Hal’s growing sense of seriousness, as he puts on the airs of royalty and his ailing father falls increasingly ill. No longer useful in any context, Falstaff is removed from the main action, drifting further to the sidelines, a fitting analogue to a mirthful director who’d himself been pushed gradually out of Hollywood, forced to fund his films via private investors and run-and-gun shooting techniques. Like so many of the director’s films, Chimes at Midnight concerns the downfall of a disreputable larger-than-life figure, and by working in the familiar form of the loose Shakespeare adaptation, Welles finds perhaps the ultimate expression of those feelings of defeat, a fact which instills an already mournful movie with an even deeper poignancy.